Many parents have asked me recently why we don’t use fins for the Entry level groups, and why we use them so minimally for Novice. Those are good questions. Every team has their own viewpoint on this, so it is a very debatable topic, and a very confusing one for parents. Here is our team’s philosophy of fin usage. Fins can be great in improving ankle mobility, and in helping with specific drills or focus points in strokes when traveling at slower speeds (less focus on maintaining body position). They can also help give swimmers a feel for the strokes at really fast speeds. However, as with most swimming aids, they make swimming easier, and this has its own problems. Take the fins off, and suddenly the swimmer may have a hard time moving through the water. Swimming is hard work, and toys cannot replace the hard work and effort that must be done to improve. How are they to be used in order to help the swimmer? If you believe throwing a pair of fins on a swimmer and have them swim up and down the pool with them on will miraculously improve the stroke then this next section will be a surprise. Bill Sweetnum, one of the top swim coaches in the world, and a coach of over 40 British and Australian Olympians, along with John Atkinson, another British National Coach outline several tips regarding the use of fins for young swimmers. They suggest that fins can be a great aid, but only if used accordingly. Fins should be restricted for younger swimmers, and should never exceed more than 50% of a practice in all other swimmers. Their reasonings for this is that fins should be used mainly in short rest repeat sets, sprint sets and sets that aim for maximum speeds similar to race pace. This builds muscle awareness for swimmers so that they can feel what their body does, and what it should do when travelling at fast speeds. It also allows for more repeats of a set because they are not exerting as much energy as without fins, and they are finishing at a faster rate to allow time for more repeats. However, race speed swimming is not our goal for our developing swimmers. In our Entry programs our main focus is on body position and stroke development. We do not look for swimmers to be swimming fast and doing massive distance when their strokes are still in developmental stages. This only encourages and reinforces poor habits. Our Novice swimmers are able to work harder and faster, and so fins can be helpful to increase the speed and get used to race pace swimming. The main goal for the Entry and Novice groups is good strokes, and this is not something we sacrifice for with long sets and aimless swimming, even if an aid is involved. I thought fins could help with strokes, not just swimming fast? Fins can certainly be beneficial in working on certain technical aspects of a stroke while traveling at slower speeds. However, for the Entry swimmers our main focuses are on proper body position in the water and building core strength. These are the foundations of a good stroke, and can only be built up by swimming without an artificial assist. Using fins for long periods of time will allow developing swimmers to improve some technical skills, but as soon as the fins come off, they lose body position, rendering those other skills irrelevant. Novice swimmers are past the developmental stages of the stroke and usually have reasonably good body position and enough core strength to maintain this positioning. For them, fins take care of maintaining body position leaving the swimmer to focus on technical aspects, such as hand entry or the early ‘catch’. As soon as the fins are off, the swimmer will again have to maintain body position and activate the core, while practicing the new skill. We still want to limit fin usage because Novice swimmers still need to actively engage the core and be aware of body positioning in the water. I thought fins benefit a swimmer’s kick? Fins have a greater surface area, resulting in increased resistance during the kick. If the swimmer can already kick properly, this acts as resistance training to build leg strength. However, for younger swimmers and those without a proper kick, the use of fins will result in a kick struggling to reduce resistance, leading to lower leg kicks (from the knee down) and long, slow lazy kicking instead of whole legs and continuous fast kicking. Fast twitch muscles need to be engaged and developed, which will not happen with slow, lazy kicks (Maglischo). According to one study, using fins caused a reduction of about 40% in kick frequency. Extended use of fins with developing swimmers can lead to situation where removing the fins leads to a true struggle to move forward with any speed. If they can swim more with fins, why shouldn’t they use it all practice? Lots of swimming does not equal a good swimmer. Lots of swimming with good technique does. Throwing fins on kids may help them swim larger distances than without them, but they do not serve any benefit unless used for certain purposes as discussed earlier. Our goal is not to see how many lengths a swimmer can swim but how many they can swim holding a good stroke. For younger levels, holding a good stroke takes lots of concentration and usually cannot be carried past 1 to 2 lengths. We stick to 25’s and 50’s for the younger levels (Entry) to ensure they can rest enough (physically and mentally) before doing the next drill in order to do it properly. 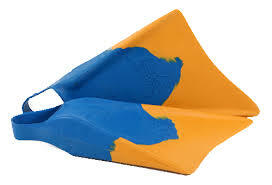 Why can’t swimmers use fins for fun or for 5 minutes each practice? We have only limited time for each practice. It takes time to put on fins, and time to take them off, a process that usually reaches up to 10 minutes (tested multiple times). In a 45 minute practice, this 10 minutes of wasted time is not acceptable.